Best Rib Recipes – you’ll want to try all of these! Easy Fall-off-the-Bone Ribs – from me (Girl Heart Food) – These are a favourite in our home…and for good reason! They’re generously rubbed with a sweet and spicy spice mixture, oven baked and finished on the grill with bbq sauce. Korean Gochujang Ribs from Bacon is Magic (pictured below & photo credit) – if you haven’t heard of gochujang, it’s the new sriracha and packs A LOT of flavour. What a yummy addition to ribs! Orange-Whiskey Fall-off-the-Bone Instant Pot Ribs from Platter Talk (pictured below & photo credit) – With flavours of orange and whiskey and on the dinner table in about 40 minutes, what more could you want? Huli Huli Ribs from Kevin is Cooking (pictured below & photo credit) – These ribs are marinated overnight in a pineapple juice/soy sauce mixture and then cooked one of two ways – smoked or grilled. It’s great to have options! Crazy Tender Oven Ribs with Spicy Citrus Brown Sugar Glaze from Sweet Tea and Thyme (pictured below & photo credit) – These have the whole sweet/spicy combo goin’ on! Love the addition of molasses in the glaze. Instant Pot Ribs West African Style from Recipes from a Pantry (pictured below & photo credit) – This low carb recipe is suitable for both the oven and grill. There’s a generous amount of ginger in this one so you know it’s going to pack a delicious punch of flavour! 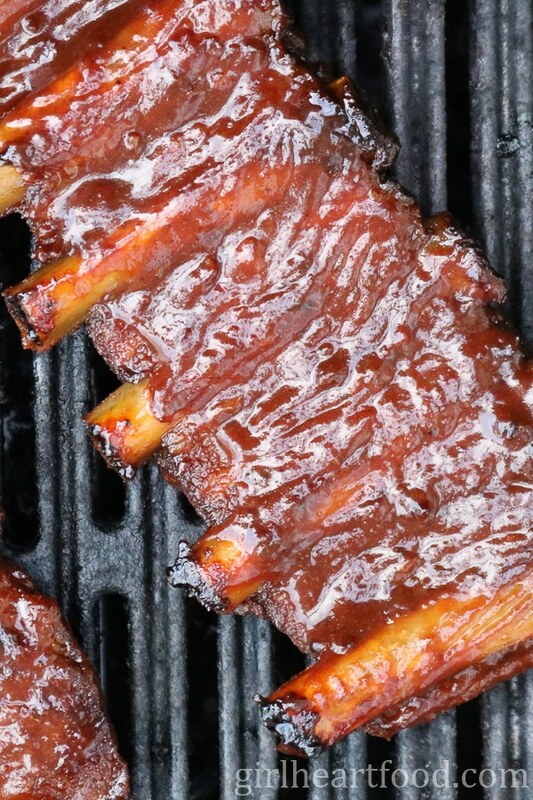 Sticky Asian Ribs from My Kitchen Love (pictured below & photo credit) – These have a delicious Chinese Five spice based rub and a honey/soy sauce based sauce – so good! Nice pairing with noodle too! Instant Pot Short Ribs from Savory Tooth (pictured below & photo credit) – Beef short ribs are a big time comfort food. These have the addition of balsamic vinegar (which I love). Hoisin and Ginger Pork Ribs from Eat, Little Bird (pictured below & photo credit) – With lots of garlic and hoisin sauce, these pork ribs are not your average ribs, my friends. Bourbon Baby Back Ribs from Dishes Delish (pictured below & photo credit) – Totally fall off the bone with a delicious bourbon infused sauce. Instant Pot Apple Glazed Ribs from Krumpli (pictured below & photo credit) – Pork and apple go hand in hand, don’t ya think? And because these are made in the Instant Pot, they come together quickly. Crock Pot BBQ Ribs from The Rising Spoon (pictured below and photo credit) – Only 10 minutes of prep and 4 hours in your Crock Pot and you could be enjoying these delicious bbq ribs! Oven Baked Asian Ribs with Crispy Onions from Kitchen Sanctuary (pictured below & photo credit) – I’m all over these delicious oven baked ribs with that crispy onion and chili topping. There’s no stopping at one with these! How to Make Baby Back Ribs on the Grill from Feast and Farm (pictured below & photo credit) – Less than 2 hours, you can be enjoying these yummy baby back ribs! Under 60 minute Instant Pot BBQ Ribs from Went Here 8 This (pictured below & photo credit) – 4 ingredients (yes,4!) and about 1 hour and these ribs could be yours. What are ya waiting for? Easy Oven Baked Ribs with Blueberry Bourbon Sauce from The Foodie Affair (pictured below & photo credit) – Using a delicious Blueberry Bourbon BBQ Sauce, these oven baked ribs are perfect for your next get together! Oven Baked Ribs in Sweet Rum Molasses Glaze from Feast in Thyme (pictured below & photo credit) – Rum and molasses glaze? Can you imagine how delicious this tastes?? White Barbecue Sauce Paleo Instant Pot Ribs from What Great Grandma Ate (pictured below & photo credit) – Using spare ribs and a white bbq sauce made from coconut milk, this is a delicious mix up! Tender Hickory Smoked Ribs from Garlic and Zest (pictured below & photo credit) – These are smoked using hickory wood chips – yummy summertime cooking project right there on a sunny day! Watermelon Beer Baby Back Ribs in the Instant Pot from We are not Martha (pictured below & photo credit) – Ribs made with watermelon beer and a watermelon bbq sauce for one iconic summer dish! Blueberry BBQ Sauce – Me (Girl Heart Food) – Using one of my favourite berries, this sauce is delicious on ribs (of course), chicken and veg! So much more tastier than store-bought. Moroccan Honey Barbecue Sauce from I Just Make Sandwiches (pictured below & photo credit) – This honey based bbq sauce has so many wonderful flavours and pairs lovey with chicken, pork ribs and salmon. Cherry Chipotle BBQ Sauce from Erica’s Recipes (pictured below & photo credit) – A little sweet and a little smoky heat makes for one delicious, balanced bbq sauce. Easy Homemade Apricot BBQ Sauce from Salt and Lavender (pictured below & photo credit) – This one is made with lots of fresh apricots for a delicious twist on homemade bbq sauce. Slow Cooker BBQ Sauce from Tasty Ever After (pictured below & photo credit) – This homemade bbq sauce is made right in the slow cooker and has a little sweetness, a little heat and lots of garlic. So good! Carolina Mustard Sauce from A Fork’s Tale (pictured below & photo credit) – This savoury mustard based sauce can be made in 10 minutes and is delicious on pork and chicken. Keto BBQ Sauce Recipe from Savory Tooth (pictured below & photo credit) – this keto bbq sauce recipe is low carb and sugar free. It’s sweet, tangy, and slightly spicy. Great on pulled pork, ribs and brisket. Root Beer Espresso BBQ Sauce from Away from the Box (pictured below & photo credit) – This one has a full bodied flavor full of sweet and spice. Talk about unique too! Smoky Rhubarb BBQ Sauce from Rhubarbarians (pictured below & photo credit) – This easy vegan barbecue sauce is made with fresh rhubarb! It’s tangy and sweet with a touch of smokiness! Kansas City Style Dry Rub from Kevin is Cooking (pictured below & photo credit) – This brown sugar based dry rub packs a whole lotta flavour! Homemade Mustard Dry Rub Seasoning from Thrifty Jinxy (pictured below & photo credit) – this dry mustard based spice blend has only 6 ingredients for one flavourful rub! Ribs Spice Rub from Simply Happy Foodie (pictured below & photo credit) – this spice blend is delicious for ribs and more! Low FODMAP Jerk Seasoning Spice Blend from Feast in Thyme (pictured below & photo credit) – This spice blend has a Caribbean flair with lots of warm spices like allspice, cinnamon and nutmeg and some chili for heat. Hope you find lots of inspiration here with all these delicious rib recipes, homemade bbq sauces and spice rubs! I’m pretty confident you will 😉 Which recipe will you be starting with? After I clean up the drool, I’m heading straight to the store to buy some ribs. Love when they go on sale for the 4th! Hahaha! Thank you Kitty!! Can’t beat that 😉 Happy 4th to ya! I LOVE ribs! And I love that you give options for sauces and rubs!! I’m definitely going to come back to this post and try some of them out! Oh this is a very inspiring collection of recipes! These spice rubs and sauces can be used for so many amazing dishes too, I might even try some with grill-able halloumi or paneer cheese. Mmmm. Thanks for sharing! I’m certain this is the best roundup I’ve ever seen. BBQ foods are my favorite, no matter what type of food. I can’t wait to whip out my grill and get cracking! Simply Amazing, Dawn! Drooling right now looking through all those delicious images of ribs, I am always leaving hungry after reading your blog no matter whether I have just eaten or not 🙂 Need to try some of those sauces asap especially while we are still experiencing a heatwave here in London. Have a wonderful weekend ahead, Dawn! Holy wow! This is one amazing roundup – and just in time for 4th of July! You’ve totally got me craving ribs, and I can’t wait to try some of these sauces and rubs – I’ll bet they’re amazing on lots of other meats. Holy moly, you’re not kidding about the ultimate rib lineup! Drooling over here!! Probably not the smartest idea to read your post so close to midnight. Now I’m so hungry lol! We always have ribs (part of our Costco problem haha) so we’re always (always!) doing ribs – baked, grilled, slow cooker. This is perfect! Love how you included sauces too. Wee! We’re so happy. Can’t wait to try them all. Hope you’re having a lovely summer so far Dawn! What a delicious looking roundup!’ We love ribs here – one of the few meats the boys devour! I’ve got my eye on a few of these recipes! I hope your summer is off to a great start Dawn! Oh my gosh, what an awesome round up Dawn! Ribs, sauces and rubs! It’s currently suppertime and I am drooling! We cook ribs from time to time, especially when we are having a crowd over. So many new recipe options to choose from! And that blueberry BBQ sauce would definitely be a huge hit with my family! Happy Monday Dawn! Mmmmm those rib photos are making my mouth water! Thanks so much for including my apricot BBQ sauce, Dawn! You’re so welcome, Natasha 🙂 Have a great week, friend! What a lip-smackin’ list Dawn! I can taste the ribs and sauce just looking at all the photos! Thanks for sharing! Give me all the ribs! My favorites are dry rubbed, but looking at all the scrumptious sauces here I am thinking to venture out of my comfort zone A LOT this summer:) Great collection! Pinned. Happy Meaty Monday!!! Love everything about this roundup and pinning so I can go back to it all summer long. Thanks for including my slow cooker BBQ sauce too, my friend! You weren’t kidding when you called this “ultimate.” Holy cow! I want to try every single recipe but I can’t decide where to start :). Have a great week, Dawn! Haha – YEP ;)! Thanks Kelsie! You too! Thanks so much for including my West African style ribs! All these rib recipes sure have my mouth watering! My pleasure, Bintu 🙂 Have a wonderful week! OMG! This roundup is making me drool. Ribs have never looked so good and I could swim in some of those sauces. I can’t wait to try some of these. xoxo!